Anti-bullying, cancer fundraising and responsible waste management. These are often thought of as rather ‘grown-up’ issues, but the students of Two Rocks Primary School have surprised all of Perth by not only focusing on them, but by taking them head on. Over the past few months, these youngsters have been working hard to make a difference – and they may have done just that. Thanks to their efforts, and a string of ‘good news’ stories about them in local news outlet North Coast Times, the kids of Two Rocks have inspired positive action far beyond the walls of their school building. When seven-year-old Beau from Two Rocks Primary School took an interest in responsible waste management, he just couldn’t keep it to himself. Beau wrote to the City of Wanneroo last year asking if his class could design stickers to put on some of the outdoor bins in Yanchep and Two Rocks. To his delight, Waneroo City Mayor Tracy Roberts not only listened, but loved the idea. “Always keen to engage with young people who want to do their bit for the environment, the City’s waste education officer worked with the school to design and create some persuasive posters.” said Tracy Roberts. The idea was to illustrate stickers encouraging people to ‘take three from the sea,’ meaning pick up several pieces of trash every time you visit the beach, and dispose of them properly. Beau’s class created some great stickers – and the idea was such a success that a bin sticker competition was extended to all schools across Wanneroo. See the winning sticker designs here. “This is such a creative way to encourage the community to reduce litter, and we hope everyone follows the lead of these remarkable young citizens,” Mrs Roberts said. Well done Beau, and kudos to Wanneroo for spreading the good word. In March of last year, Two Rocks students made the North Coast Times again with their whole-hearted support for anti-bullying. March 16, 2018 was the eighth National Day of Action against Bullying and Violence, and Two Rocks Primary celebrated it with a bang. 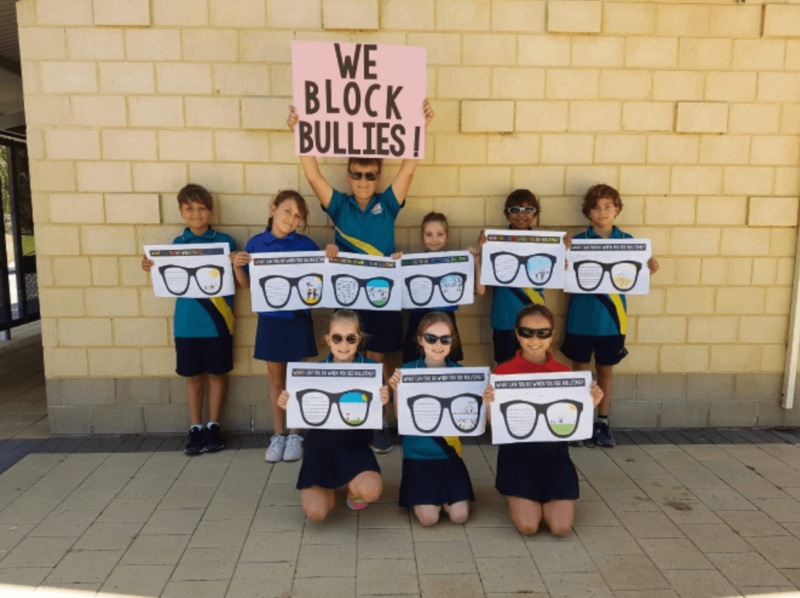 Artwork for anti-bullying messages was created, photos were taken – and the year 6 students took it to the next level with a song that highlighted the issues of bullying and bystanders. Late last year, Two Rocks Primary held a crazy hair day to raise funds for Pancare, Australia’s pancreatic cancer organisation. Reportedly, a family at the school had been affected by pancreatic cancer, so students and staff were inspired to raise $480.55 for the Pancare charity. Keep it Up, Two Rocks! We’re proud of our local students, and hope they keep up the good work! Beyond that, we’re proud of this community. Children are like little ambassadors, they take cues from their surroundings, and bring the values and skills they learn into the future along with them. Way to go, Two Rocks kids and parents!